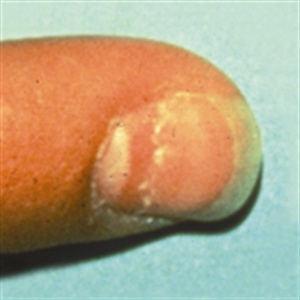 Beau's lines are linear depressions that occur crosswise (transverse) in the fingernail; they can occur after illness, trauma to the nail, and with malnutrition. The condition can be mild (in which case a technician should just use care in treating a client wtih the condition) or severe (in which case, the nail technician should refer the client to a physician). Beau’s lines are a telltale sign of trouble. However, by the time a nail tech identifies them, the only thing left to do may be to cover up the evidence.